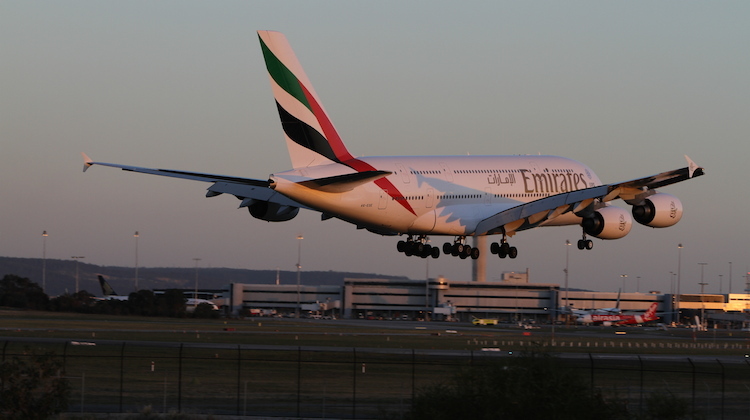 Emirates has upgauged the second of its two daily Perth-Dubai flights to the Airbus A380. The change to the three-class A380 on the Qantas alliance partner’s morning departure from Perth and overnight service from Dubai took effect from Monday, adding about 100,000 extra seats between Perth and Dubai. The EK424 and EK425 rotation was previously served with a Boeing 777-300ER. The change was first flagged in January 2016. Emirates began A380 flights to Perth in May 2015. When added to existing A380 operations at Brisbane, Melbourne and Sydney, Emirates now had seven daily flights from Dubai to Australia with the type. Go A380! One of the best airplane for pax comfort. Its a shame that the NEO version is not being made. Fortunately Emirates bought so many of them otherwise it would been a financial disaster. 100,000 extra seats?! Thats a big plane!